Good afternoon! I’m excited to be “back to work” this week after being lazy at the beach all last week with my family. When I say family, I mean throughout the week we had 17 people under one roof. My entire family goes for a week every summer to the Seagrove/Seacrest Beach area. We are enjoying summer and trying to stay cool! I posted this PFG (Performance Fishing Gear) shirt a few weeks ago. I did this for my 13 year old niece. I’m sure she saw it on Pinterest or something! This shirt led me to this post on adjusting fonts in Monogram Wizard Plus to make your monograms BIG. It’s certainly not rocket science, but perhaps you haven’t thought about it much. You can adjust the width of your fonts so that the end result is a big monogram that fills the hoop as much as possible! Pardon my photos. I’m sure there is a screen-capture-something that is easier to use than Prt Sc, then opening and pasting in Paint, blah blah blah. I’ll do my research on that. In the meantime, here are MY screen shots via my camera. This is just a regular monogram done in Monogram Wizard Plus using Kim Single font. As you can see (with your magnifying glass perhaps), the Letter Size is 1.67 and everything else (i.e. boldness, letter width, kerning, etc) is default 100. At Letter Size 1.67, the name turns out to be 2.09″ tall and 7.03″ wide, which would probably fit in your 5×7 hoop just fine. Not too bad, but by adjusting the Letter Width, you can make the name taller which appears bigger even though you are still in the 5×7 hoop. Here I adjusted the Letter Width to 85 and the Letter Size to 1.95. 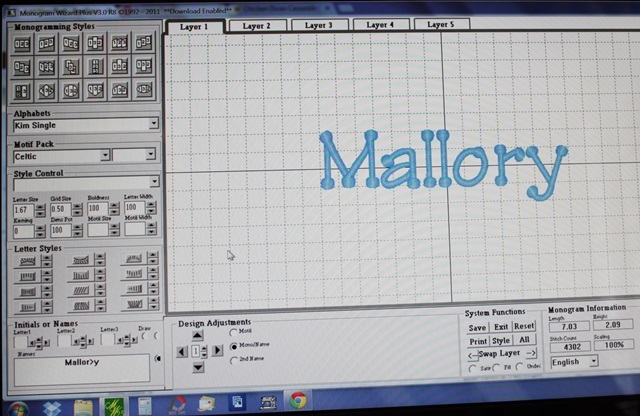 My name is now 2.45″ tall and 7.02″ wide. Basically what I am doing is making the letters “skinnier” and taller. Width of the name stays about the same to fit in the 5×7 hoop. Here I decreased the Letter Width down to 75 and Letter Size to 2.20. Now my name is 2.77″ tall and 6.99″ wide. By decreasing the Letter Width and increasing the Letter Size, Mallory is now almost 3/4″ taller than what I started out with! With some fonts you can also adjust the Kerning, which makes letters closer together or farther apart. With this particular font I can’t really get them any closer together. You might notice above, the “>” in Mallory (Mallor>y). See THIS POST for an explanation of that! If your letters are spaced unevenly with certain fonts, check out the post! So now on to another PFG shirt I did for my other niece. I want the monogram as big as I can get it and I want to use my 5×7 hoop. As you can see below, Letter Size is 3.00 and everything else is default. 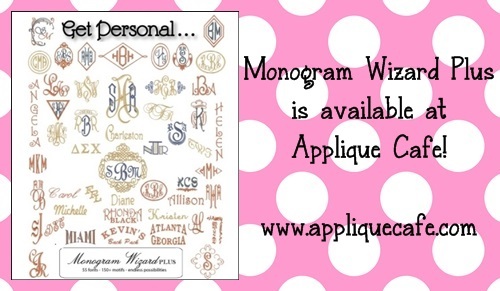 The monogram size at these settings is 6.96″ wide to fit the 7″ wide hoop, and 3.00″ tall. Not bad, but I can get it a little bigger. 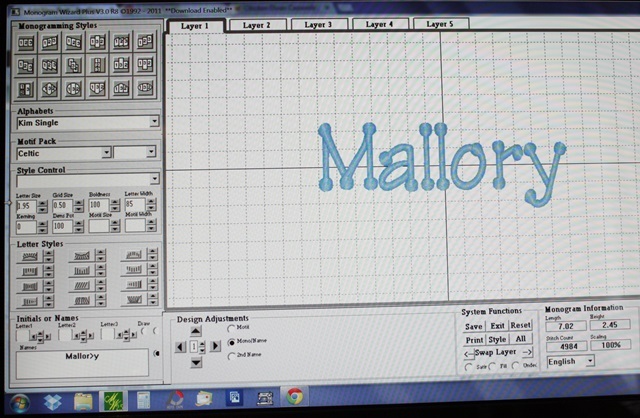 This is Monogram Wizard Plus “Sydney” font. Below I adjusted the Letter Width to 85, which “skinnies” up the monogram to 5.85″ wide (still 3″ tall). I can now increase the Letter Size to get the width back up to closer to 7″. I bumped the Letter Size up to 3.55 (Width is still 85) and now the monogram width is 7.01″ and 3.55″ tall. Bigger! Below I adjusted my Letter Width a little more, down to 80, and Letter Size up to 3.75. NOW my monogram is 6.96″ wide and 3.75″ tall. 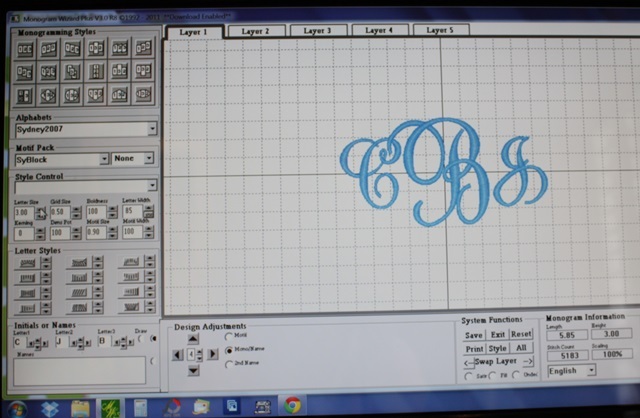 By making these adjustments, my monogram went from just 3″ tall to 3.75″ tall. It fills the hoop much better and the monogram will be much bigger on the shirt. 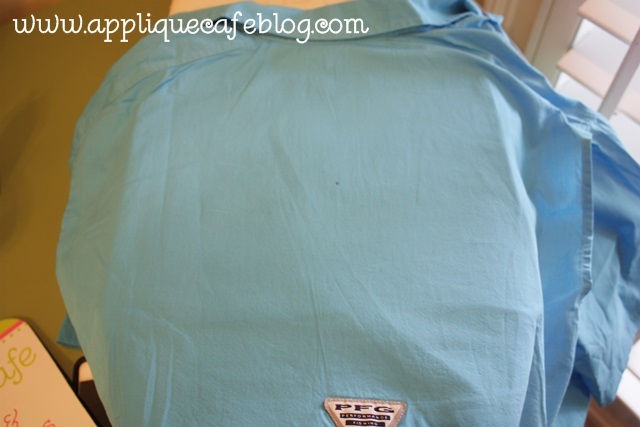 I took a few shots of the shirt as I got it ready to monogram. I marked my center on the back of the shirt (top panel). These shirts are “vented” so I inserted a piece of cutaway between the top layer I’m monogramming and the “net vent stuff”. On my 6 needle machine, I hoop with the frame inside the shirt. Again, I’m using cutaway on the inside and I am using water soluble on top (just for extra stabilization). I only had precut squares of the solvy so that’s why you see 2 pieces. I put the hoop on my machine upside down, so the monogram is rotated upside down and I had to make sure the arm of my machine was inside the 2 layers of shirt! Sorry this part is a little confusing! If you ever try to monogram one of these shirts, this will make sense. Here is the finished shirt. When finished I unhoop, trim the excess cutaway stabilizer from the inside and then just pull away all the water soluble from the top. I hope that helps! Again, NOT rocket science with the width/letter size adjustments, but if you are a newbie you may not have realized you could make your monograms a smidge bigger! Great post! I use MW-EF and love it, but I haven’t spent much time learning all the tricks. Thanks for breaking this down into a user friendly guide. Love it. Thanks for showing this. Now I have to go do one. Do you have a problem with it skipping stitches when you change the size? Monogram Wizard Plus is totally sizable – you can make a font 1″ tall or 5″ tall. It adjusts accordingly! 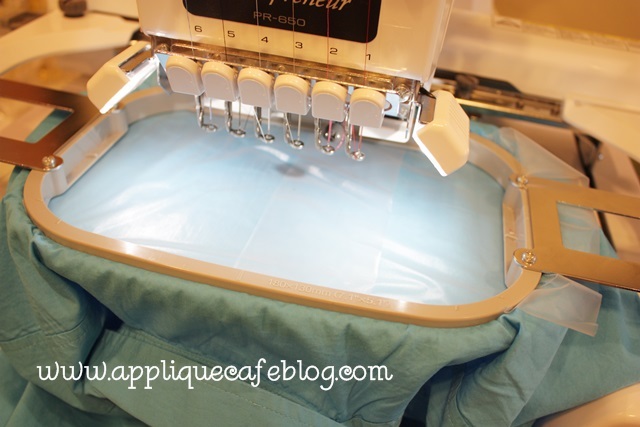 Does monogram wizard work with a sewing/ embroidery quilting machine ? My husband bought me a brother machine I can do little same size block style but not w sizes. . I’m frustrated. It says I can hook up a computer to it tho. 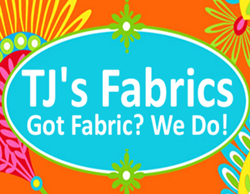 It should work with any embroidery machine! What format does your machine take? Is it a true embroidery machine? Great post! I would love to see a post about boldness and density! Wonderful post! What type of machine do you have? I have a Brother SE 400, with only a 4 X 4 frame. I am looking to upgrade to a 5X7 machine soon. I have a 6 needle Brother PR650. You might check out the PE700 machine (or whatever the current model is)!! Thank you SO much for this simple instruction on how to do this, the kernals, etc. I am printing them out & hope to get to use them soon!! How can the instructions be printed out? I get it, thank you….I have so much to learn! 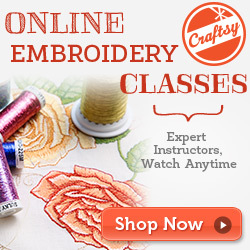 I am new to machine embroidery, only have a one needle machine, I just need to practice, practice, practice. Kim Single is a MWP font. I think I bought the disk years ago – should be on their website?? We don’t sell any fonts! I am not hooping the net part! 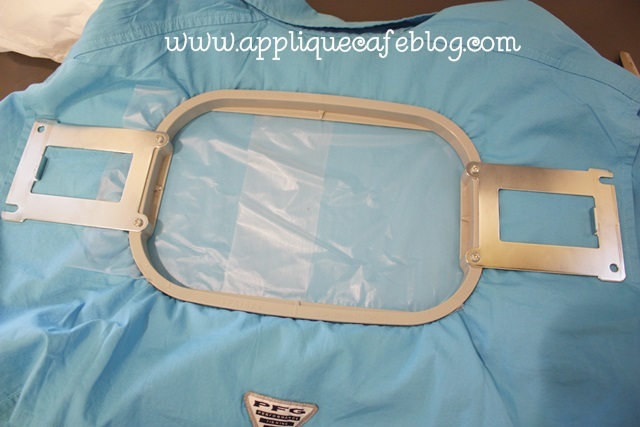 That part is underneath the arm of the machine and is not hooped or sewn. I have a PE 770 and I am a bit confused on how the only hoop the material and not the net? Because when I pull the rest of the shirt up, the net will still be under the machine therfor it will be embroidered. Thank you for your help in advance!! What do you mean by the net?? On a single needle you would have to sew the net shut I think! I’ve even had to sew it shut on a multi needle before – it depends on how it’s sewn and how big the opening is! There is usually a tool called “Snip It” under Accessories that makes capturing screen shots a MILLION times easier. I need to look in to that!! I have a brother SE400. do you recommend Sew What Pro or Monogram Wizard for software? I use both! MWP is strictly fonts. SWP is for merging those fonts w/ applique designs, minor editing, etc. Or you can use SWP to merge bought fonts, but MWP is super easy to use. When you say your hooping inside the shirt do you mean the vent part of the shirt or actually the inside of the shirt? Thanks and love all the tidbits you share with us. No I am just hooping the shirt with cutaway underneath and solvy on top. The vent net part does not get sewn or hooped! Any idea in MWP where to find a font that has the character for $ or &? Sorry I am just now replying! You can download a free motifs set (4 actually I think) and they are symbols and such. 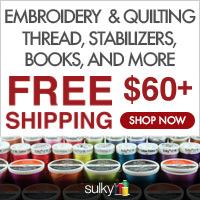 http://www.needleheads.com/SewingStudio.asp – scroll down to the bottom for Motifs. Oh my goodness! Thank you for that; I’m going to get busy. Rosemary, you’re the best! LOVE your blog posts! They are extremely helpful! Thanks Rosemary! As many years as I have used MWP I did not realize I could resize my initials in this simple way. Love your tips. Thanks for the photos. 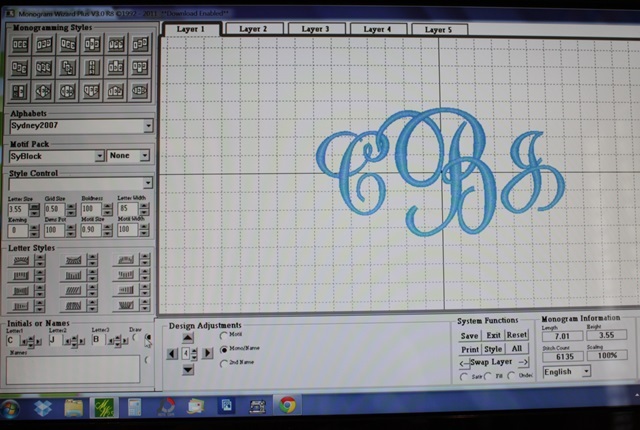 What machine is used for monogramming ? You CAN use the 5×7 hoop to monogram like this – for these shirts you would have to monogram through both layers of the shirt. With a single needle you wouldn’t be able to monogram inside like I did. Does that make sense? I believe I used the 5×7 hoop on these, but with a 6 needle machine. Hi Rosemary. Thank you so much for this post it has really helped me alot. I do have one question. 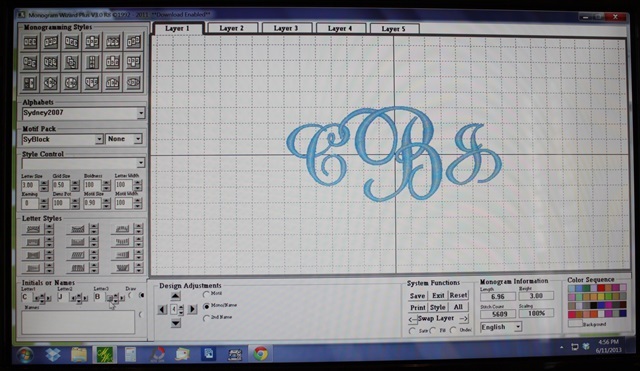 I am a new owner of a pr655 and I was doing the large monogram on a sweatshirt front. It seems some parts of the letter is not as full as other spots. I’m wondering if I just need to backup the needle and go over it an additional time to create the fullness of the rest of the letter? Any thoughts? It’s hard to say without seeing it?? I turn it on there or on the machine? I want it to be wider. Please help! Yes you could make it wider – just so it’s not wider than 7″ and 5″ tall you can do it w/ your 5×7 hoop on that machine. I didn’t even know you could do that? I’m not sure. Do you get comments on that post or all posts? I have a brother se400 but im looking into the singer 9960. Can you still achieve this with a sewing machine or no? It must be an EMBROIDERY machine! I have a customer that wants 7 & 8″ letters, so I guess I will have to use my jacket back hoop. I’m wondering if you sewed the back flap yo the mesh material under the flap? 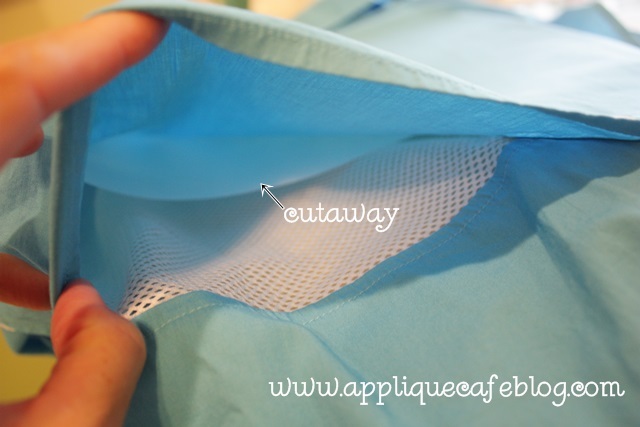 If you can’t get the hoop inside, then yes you’d need to sew the mesh to the back flap. I’ve done it both ways! That tag sometimes gets in the way! 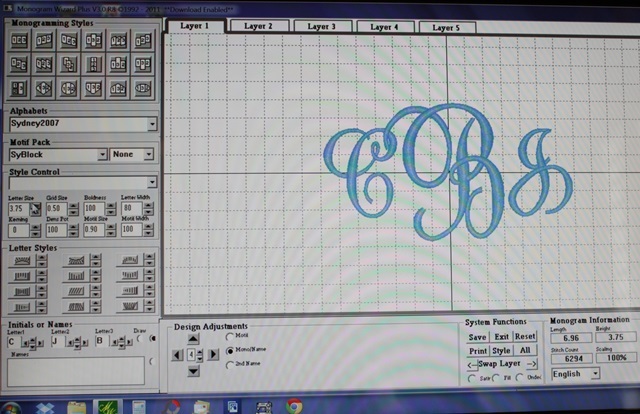 Was wondering if you knew how to import outside designs into Monogram Wiz Plus with the Extended features? I don’t see anywhere on the MW that says “import” ??? I only have regular old MWP. I don’t use Extended Features so I’m afraid I have no idea!?!? I use Sew What Pro for merging. I did one of these today and it seemed to move in the hoop since it was so thin. What am I doing wrong? Did I not tighten enough? This happens to me also when I do thin pillowcases? Thank you!!! What type of stabilizer did you use? I typically use solvy on top which keeps the shirt from shifting. Hi Rosemary! Your blog is wonderful! I am the new owner (with my mom) of a dreammaker xe and we have not yet purchased software. I know you are a fan of MWP and SWP. I do not love most of the fonts in MWP. I know you can buy add ons or buy the Extended Features Pack and add fonts that aren’t MW fonts into their program. In that case, would you think that SWP is good enough not to spend the $450 it’s going to cost me to buy MWP and the Ext. Features Pack and just load my fonts using SWP? I am not going to be doing this as a business, so speed isn’t critical. What I do what is something that is easy enough to use that will get me a good looking and centered design. Does SWP fulfill that for me in your opinion? I am going to download the trials also, but would really like your opinion! Thank you so much! I would go with Sew What Pro – in Extended Features I believe you are limited to 5 layers, so you are limited to what all you can merge together. In SWP you can merge together 39 things if you want! It’s also cheaper! I can’t believe I just found this blog, and most of all bout this shirt,,, I have one now to do only did one before,, and I went to the trouble of taking the logo tag off and then monogramed it and then sewed the logo back on.. but I used peel n stick,, trying to not let it look so puckery looking,,, used the water solvy on top also,,, worked out good ,,, but a lot of trouble the way I did it,, took every precaution cause their so expensive, didn’t want to replace it !! You describe how to embroider between the layers by making sure the arm is between the 2 layers. But this is on a multi-needle right? I don’t see how this is possible with a single needle. Is it? Yes, that is with a multi needle! I’m afraid with a single needle you would have to sew the layers shut. I’ve even had to do that w/ my multi needle when the opening wasn’t big enough. Can I monogram in middle of shirt with the se400? You have to get creative with the 4×4 hoops but I don’t see why you couldn’t, unless it’s a tiny shirt which might be tough?? I have several of these fishing shirts to monogram………… You mentioned a cut a way stabilizer. I would like to know what kind / weight of stabilizer to use. The monogram will fit in my 7.5 x 11.5 hoop – So rather large monogram. I don’t want it to pucker. Your website is awesome, and thanks so much. The cutaway I use is about 2.0 or 2.2 oz. I also did a fishing shirt a week or two ago and it was a small one, so I had to monogram through the mesh part. I used a waffle weave cutaway and solvy on top! When I use applique letters I have purchased from Needleheads.com it works great with increasing or decreasing the letter width or kernig. 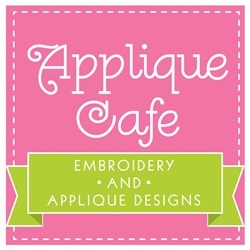 But if I use applique font letters I have purchased from Etsy, I can’t get it to work correctly. I can place each applique letter when I want but when i try to make the height bigger, I won’t let me. Am I doing something wrong? Or do I have to use just the applique letter sets from Needleheads? Are you using Extended Features? How do you keep the large monogram from having “dimples” in it? I am trying to stitch a 8″ x 10″ master circle monogram. When I transfer it to embird, and look at in 3D, it appears to have some areas that will have a stitch in the middle of the satin stitch. Any ideas? 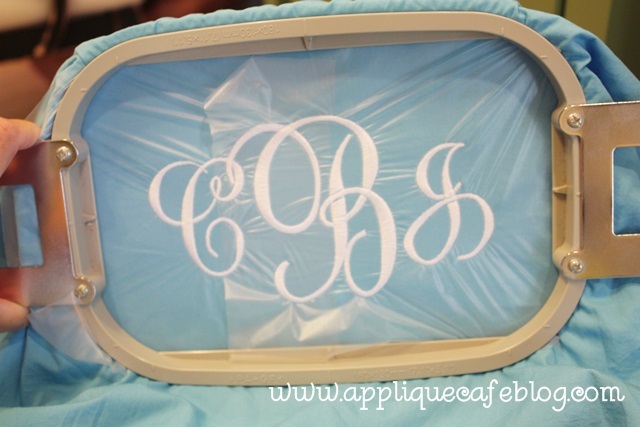 I think the dimples are to keep the monogram from picking b/c the satin stitch is so wide!